King Arthur Flour Lemon Juice Fruit Powder - 6 oz. For strong, true lemon flavor. Perfect for icings, sauces, and glazes. Adds extra flavor to cookies, scones, and cakes. 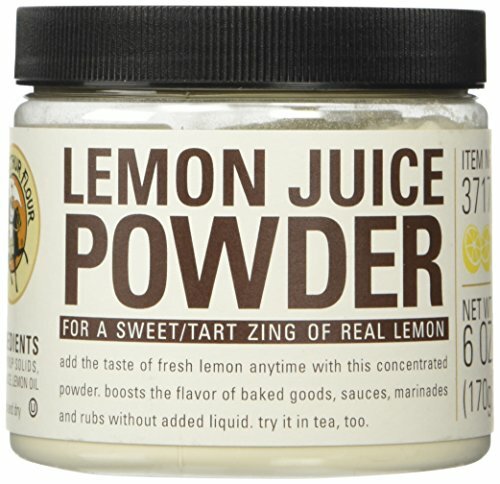 Lemon flavor in powdered form. Now in a convenient easy-to-use-and-store jar! Custom 6-ounce plastic jar filled with concentrated lemon juice powder. Made in the USA. Store cool and dry for one year. Please don't try to add water to these juice powders to make juice - they don't dissolve in liquid, so it's not a good idea.